I’ve spent a while messing about with my BTpodshow (or Podshow+ or whatever it end up being called!) profile, and for ages I haven’t been able to work out how to edit the “About Me” text. I’ve been pulling my hair out over it (well, metaphorically at least). At last I’ve worked out how. You need to go to the ‘Master Control’ page and click ‘Edit Legend’ to change the “About Me” text. Of course! Silly me! Now I’ve done that I might find the energy to change how the page looks. Is it a bird? Is it a pasty? No! It’s KernowMan! Having just moved house, and having just packed all my books and CDs, I decided that I really ought to catalogue them. I’ve been tempted by Delicious Library for a while now and thought it an excellent time to buy it. Luckily, I heard about MacHeist, who, at the time of writing, are offering Delicious Library and 8 other software titles for just $49. This includes RapidWeaver, Shapeshifter, TextMate, NewsFire, FotoMagico, Disco, iClip 4, DEVONthink Personal, and a Pangea game. To buy them all separately would cost you $307.74, so that’s rather a bargain. For every $49, a proportion (25%) of that money is donated to a charity, so even better. MacRumors point out that currently, MacHeist has raised over $100,000 for charities with this current offer. But it isn’t without some controversy. Without going in-depth at how MacHeist managed to make such a good offer (I’m not party to specifics), there are a number of critics mentioned on the MacRumors article. Casa Bottega, Herculaneum, originally uploaded by T.A.G. 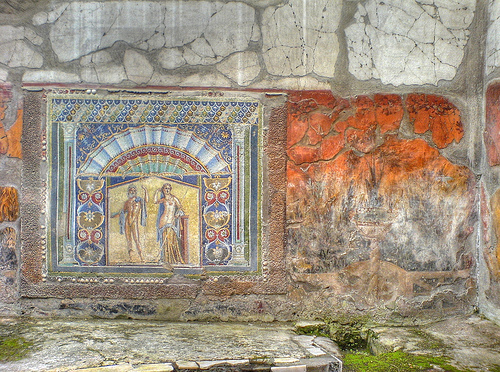 This photo of the Poseidon and Amphitrite mosaic in Casa Bottega, Herculaneum, Italy, was taken with a Sony Ericsson k750i camera phone. I took three photos, staying as still as I could, altering the EV level for each one, exposing the sky, one normal photo, and one exposing detail in the shadows. The resulting images were then imported into the excellent Photomatix software where they were aligned and combined into a single HDR (high dynamic range) image. Using the tools within Photomatix, I “tone mapped” the HDR image so that the resulting image was roughly an average of all colour values captured by the camera in the three images. As you can see, this gives this image a ‘painted’ feel. It’s quite an unnatural image (as many HDR images are), but quite compelling nonetheless. This website, and most of the others that I run, are now happily sitting on Dreamhost servers. I’ve been using them since February, and they’ve been great so far. It took me a while to get the Windows hosting paradigm out of my head, and I haven’t looked back. I’ve used their support via email a couple of times and their response has been timely and helpful (both things were my mistake – ho hum). This blog, for example, was installed with just a couple of clicks using Dreamhost‘s “one click installer”. When a new version of WordPress is released, I can just click the “update” button, and hey presto, my blog is backed up and WordPress is updated. Not to mention more bandwidth and diskspace than you can eat, with multiple and true sub-domains to boot. And it all seems to run fast enough for me. Every day is filled with bizarre behaviours and comments, absurd actions, wierd and wonderful people and oddity. Have a look at “Book Rant” – an anonymous blog about the ins-and-outs of the antiquarian book trade. If you’re into books – this is a must! I’ve set up this blog, called “The Hurler” “Switch Doctor” for now (subject to random change), so that I can blog about anything and everything that I have wanted to recently. My blogging started with Past Thinking, which is rapidly becoming a blog that is focussed upon heritage issues related to technology. I used to post random things about computing, Macs, and music on there, but as its reputation for comment and news grew, it has become apparent that Past Thinking is no longer the space for things other than heritage. This is fine. It’s nice that Past Thinking has found its niche, and I will continue to grow the blog, and hopefully have a co-author soon. This blog will be for everything else!